In today's news: We now have a “new” Supreme Court with Neil Gorsuch being sworn in as a Supreme Court justice. He hears his first cases, and all signs are pointing towards him being who he said he is–a judge that takes the reading of the law quite literally…just what pro-2A folk need to hear! 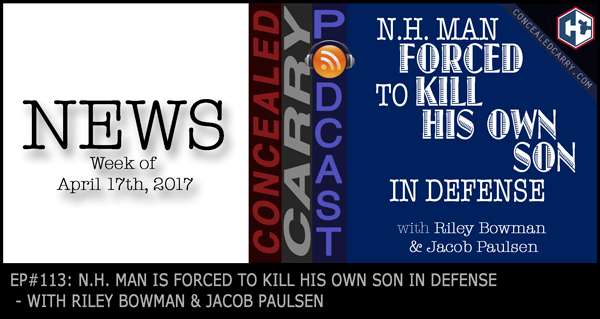 Also Riley and Jacob talk about anti-gun laws being proposed in North Carolina and Nevada. Plus 2 new guns from 2 of the biggest manufacturers. And also our usual JUSTIFIED segment where we share the story of a 76-year-old father forced to kill his 55-year-old son in a twisted story of self-defense. Don't miss it, listen in now!! Sports Afield. Now available at their lowest price ever on ConcealedCarry.com, Sports Afield brings you a series of handgun vaults that will beat any competitor in price and quality. In addition you can now find select full size safes on from Sports Afield on ConcealedCarry.com. The shipping is reasonable and the warranty is second to none. All full size safes have a lifetime warranty that even covers the paint. Trust this 100 yr old American brand with your firearm storage. www.concealedcarry.com/sportsafield and for a limited time save 10% with a special coupon code, but you gotta listen to the episode to get it! Will VHS Tapes Stop A Bullet? I have been following the Concealed Carry podcast beginning with episode 3. Awesome podcast that provides USEFUL information and training tips. Since listening to the podcast I’ve made it a habit to carry on a daily basis. Only time that I can’t carry is when I’m at work, but as soon as I leave work my firearm in on my person. I’m old school so I only carry 9mm or 45 ACP caliber pistols, preferably SA/DA Hammer fired for AIWB or 3 o’clock position. Due to my work schedule I dry fire everyday at 2×2 cards placed around my house, and try to get to the range on average twice a month. What I enjoy the best from the podcast are the justified stories, and how you guys break down the scenarios – often pointing out what errors were made during the incident. Please continue to provide more training tips for those of us that can’t make it to the range on a regular basis…every squeeze of the trigger counts! I would like to hear a future topic on AR Pistol type platforms, use and legality as a firearm option for a vehicle. OBTW: No more sound effects with Root Beer!!! I am busting a gut right now laughing about your comment to not do anymore root beer sound effects! I’m sorry, bro, but a guy’s just gotta have fun! Anyway, it is actually really inspirational to hear you tell us how you have started to carry on a daily basis since listening to the podcast. Wow! I feel as though “mission accomplished” and I can go home and hang up my hat! Just knowing at least one person’s life has been changed and positively affected due to this podcast means that it’s all been worth it. I appreciate the support (and the feedback).